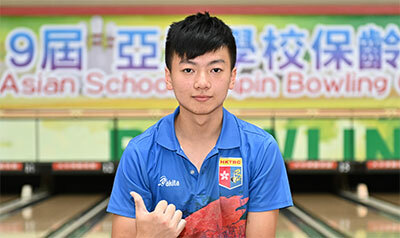 7th October, Taichung: Doubles gold medallist and 2018 Asian Games Palembang Team silver medallist, Ivan Tse of Hong Kong A showed his class when he led the Boy's Masters first block at the 19th Asian School Tenpin Bowling Championships. Singles bronze medallist, kenzo Umali of Philippines A set a cracking pace defeating his team-mate, Danielle Evangelista, 264-198 plus a 10 pin bonus for the win. Singles gols and All Events silver medallist, Genki Hayashi of Japan also defeated his compatriot, Hokuto Fujinaga 227-204 to trail the Filipino by 37 pins. 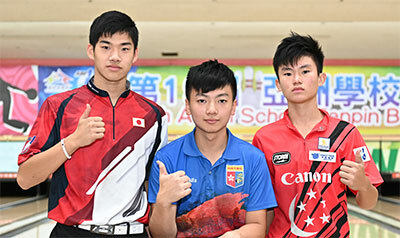 A third Japanese, Takumi Shinsha thrashed a fourth Japanese, 227-167 to share second spot with Hayashi while Owen Wong of Singapore B beat sole Taiwanese in the finals, Tseng Hun En also by 227-174 to tie third spot. Jackson Botham of Australia A won his second match with a sizzling 279 to add to his first match win to take over the lead, Tse won his first two matches with 224 and 251 to move up into second spot. Doubles silver and All Events bronze medallist, Eugene Oh also won his first two matches with 193 and 257 to take up third spot as Umali lost his second match with a poor 176 to drop down the field. Another victory in the third match from Tse pushed the 18-year-old into the lead. Botham drew in his third match to take over secopnd spot as the Filipino recovered despite losing his third match with 204. A lucky win in the fourth game for Tse with 195 kept him in the lead. The Aussie won his fourth match with 224 to narrow the gap to just 1 pin. Fujinaga won his third and fourth matches with a big game of 278 to move up to third. The Hong Kong leader was on a roll winning three of his second half four matches to lead the first block with 1833 from a total of seven wins. Fujinaga finished strong to clinch second spot with 1805 from just four wins. Yeo did not win his last two matches but scored high games to secure third position with 1768, also from four wins. Sho Saito, who was third before the eighth match, managed 191 to finish fourth with 1761 from three wins. Team bronze medallist, Brandon Ong of Singapore A rolled 279, 227, 217 and 207 for three wins an a tie to complete the top five with 1753 from four wins an a draw. Early pace-setter, Botham suffered a low game of 160 to drop to sixth position with 1750. The players will resume competition with their second block of seven matches and a position-round match tomorrow to determine the top three with the highest pinfalls plus bonus to proceed to the stepladder shootout finals.